Traditionally, the Spanish celebrate Christmas on the 6th of January, when the three Kings arrive and give gifts to the children. Roscón De Reyes is a bread / cake that is eaten at this time. It's similar to brioche, but made in a ring, like a crown, and decorated with candied fruit, like jewels. Roscón De Reyes is also popular in Latin America, where it is known as Rosca De Reyes. Put the flour into a large mixing bowl. Add the salt and the yeast. Stir well, then rub in the butter and stir in the milk. Some people prefer a sweeter or flavoured roscón, so you could add a little sugar, maybe some orange essence, maybe a small handful of sultanas - but don't go crazy, it should be more bread than fruit. Mix the dough until it forms into a ball. If it's too dry, add a teeny bit more milk, but it shouldn't be sloppy. Knead the dough for 5-10 minutes until it is smooth and elastic. Pop it back in the bowl, cover it with plastic film and leave in a warm place to rise until it is doubled in size - about 1-2 hours. Ideally, you want whole candied slices of fruit, or long strips or diamonds of candied peel. If you can't get these, you can make your own quite easily. Cut citrus fruits such as lemons, limes, tangerines, into 5mm (quarter inch) slices. Remove any pips. Make a simple sugar syrup by dissolving sugar into water - you should have 3 times more water than sugar. Bring the syrup to the boil, then turn it down to a simmer. Put the fruit in and make sure it remains covered by syrup at all times. Simmer gently for 40 minutes. Drain the fruit and put in a warm place to dry completely - this might take a day or two. Sprinkle with sugar both sides, and use. When the dough has doubled in size, roll it on a floured worktop to knock the air out of it, then form it into a thick sausage. Line a baking sheet with greaseproof paper. Put the sausage on the paper and form it into a ring. Stick the ends together with a little water. Cover with a clean tea towl and leave to rise again for about an hour. Preheat your oven to 160°C (320°F) for a fan oven, or 180°C (356°F) for a conventional oven. Brush the dough ring all over with beaten egg and milk. Place candied fruit on top and bake for 25 minutes. To test whether it's done, insert a skewer into the thickest part - it should come out dry. Also you can turn the roscón over and tap the bottom - it should sound hollow. Allow to cool on a wire rack. Eat and enjoy! The video above is from the Keef Cooks YouTube channel. 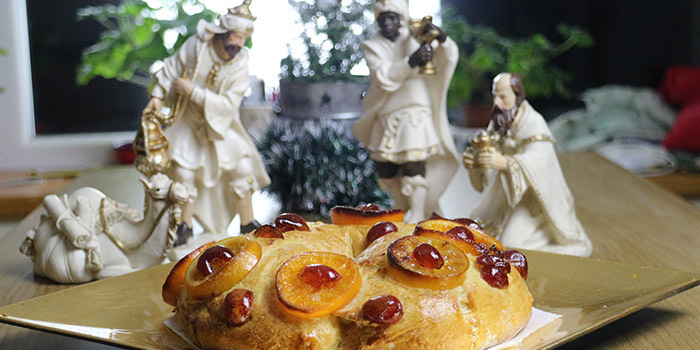 Click here to see the video recipe of Roscón De Reyes on YouTube. Candied fruit to decorate - whole slices of lemon, lime and small oranges or tangerines are best. Beaten egg mixed with a little milk to glaze. Prep time: 15 minutes. proving time: 3 hours. Total time: 3 hours 40 minutes.